If you’ve had freshly squeezed juice at Sunterra’s TransCanada Tower location in the last seven years, Yoseph Kibert squeezed it. By hand. To find out how it’s done, I head downtown to watch Yoseph in action. A consummate worker, he has everything set up when I arrive. Boxes of California oranges sit on the stainless-steel workstation, nearly blending into the colourful backsplash. First the oranges are washed in warm water, so that any potential dirt on the peel won’t get into the flesh when they’re cut. With an urgent precision and cadence, Yoseph cuts the clean oranges in half and throws them into lined boxes. “I’m very fast at washing and cutting,” explains Yoseph, “but I take my time squeezing to make sure I get all the juice.” Good taste, it seems, just can’t be rushed. 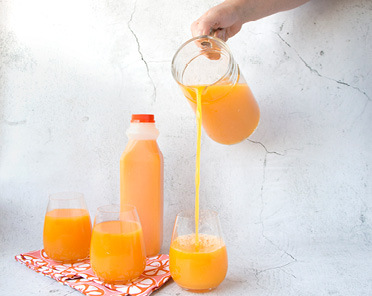 He pulls out the small juicing machine, the top of which he stores in the fridge to keep it clean and dust-free. Yoseph washes his hands like a surgeon, thoroughly and up to the elbow, then puts on gloves and gets juicing. 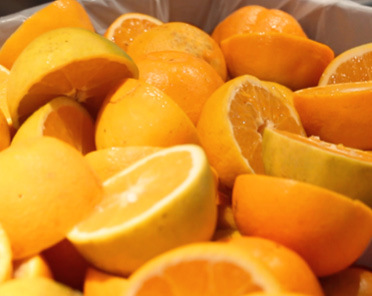 With a box of washed-and-sliced oranges on either side of the machine, Yoseph grabs half an orange with his left hand, massages it on the juice reamer until every last drop has been extracted and then throws the peel into the compost bin on the floor. In the meantime, he grabs half an orange from the other bin with his right hand and presses it to the reamer as soon as the previous orange is done. 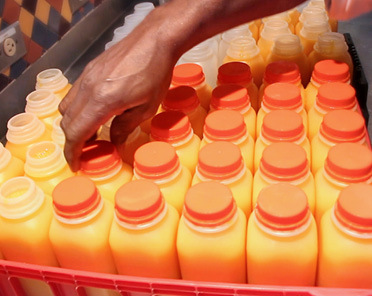 Back and forth, Yoseph keeps a steady stream of orange juice pouring until both boxes have been juiced. “That’s a lot of work,” says Tony Colombo, manager at Sunterra Market, TransCanada Tower. “Why would we go through that?” He explains that their mission is to give customers the freshest and the best products. It’s the same reason they make bread from scratch, he says. It may be a 36-hour process, but it’s worth the effort to have the freshest bread with the best quality. For orange juice, Tony says they could buy a hands-free juicer, dump in a case of oranges and have the juice come out the other side, but there’s just no show in a machine. Indeed, as Yoseph juices the oranges, the entire space is filled with a sweet, fresh fragrance that brings people over to the juice bar. He’s juicing, sampling and talking to customers all at the same time. Having finally squeezed all the oranges, Yoseph now measures out the juice, fills the bottles and puts the lids on by hand. He methodically wipes each bottle, checks the lid once more and then sticks the labels on – you guessed it – by hand. Then it’s straight to the cooler shelves for loyal juice lovers to enjoy.